On our second day in Madeira we were on a private bus tour that took us throughout the western portion of this beautiful island. Madeira really has everything: seashores & fishing villages, cliffs & mountains, flowers rocks & surf. This was a long (8 hours) tour & we visited a number of places, so this post is going to be mostly made up of pictures (I’m sure you are grateful to hear that). First we visited the picturesque fishing village of Camara de Lobos, a favorite vacation spot during the 1950’s of Winston Churchill, who liked to paint the scenery here. The town was full of beautiful plants & flowers. I wish I could name all the flowers, but I can’t (as you will see from the captions). A little further along the coast we stopped at Cabo Girao, at 580 meters the second highest sea cliffs in the world (our guide thought the highest might be in Taiwan, but wasn’t sure). There is a glass platform to walk on extending out over the cliff. OK, next was Ribeira Brava, a small resort town (village). They had a lot of construction going on, apparently moving rocks & rubble from the river to the shore, where they are building up the area behind their sea wall, which held off a roaring surf. There was a lovely little 16th century church, all dressed up for Lent. Mary bought a t-shirt here with an embroidered bird of paradise on it – less than half the price asked for the same shirt in Funchal. Next we drove way up into the mountains and, after a stop for some photos & to visit a tourist store, we drove across a relatively flat, soggy high plans called Paul da Sierra. It was really foggy during this part of the trip, so very few pictures (and much sleeping). 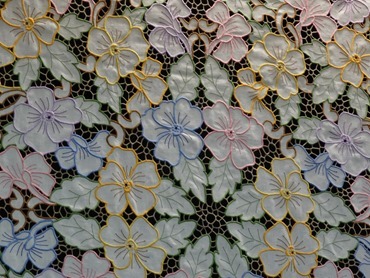 I may have mentioned that, in addition to wine, Madeira is known for its fine embroidery. 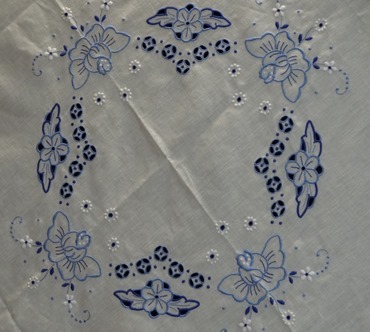 Not cheap though: we saw an embroidered table cloth in a Funchal window selling for about $9000.00! And you know that if you bought it someone would spill the wine the first time you used it. In the mountaintop shop was some nice embroidery selling for hundreds rather than thousands of dollars, but we took a pass anyway. We stopped for lunch (marinated tuna for us) in the little village of Porto Moniz on the northwest tip of Madeira, about as far (47 miles) from Funchal as you can go without getting wet. About 4000 people live there. We stopped for pictures on the mountainside above the town, but the best views were at the ocean where the surf pounded some fabulous black rocks. Madeira is a volcanic island (some say it is what is left of the lost continent of Atlantis) & we saw quite a lot of volcanic rock, natural and used to build walls & buildings. I mentioned that the whole island is heavily terraced for houses and small fields, and you can see below some of the terracing above Porto Moniz with grape vines (not yet green) on some levels. You are probably wondering by now how many more stops, but there are just two more. Seixal is a very small village with a profusion of wildflowers on the hillside, including a whole field of wild lillies. And finally, Sao Vicente. This village was originally at the seashore, but was repeatedly pillaged by pirates. So in the 16th century they moved the whole village inland about a mile & rebuilt it in a valley behind some cliffs & rocks where it could no longer be seen from the sea. And so back to Prinsendam, well in time to make the all aboard deadline of 4:30. But then the Captain announced that they were about to replace the capstan on one of the engines, a huge piece of metal that could prove dangerous at sea. So our departure was delayed until 8:00. And Funchal looked quite beautiful after dark. But then departure was delayed until 10:00. Then about 1:00 in the morning the ship was filled with a loud grinding sound that lasted quite a while, which seems to have been the testing for the work that had been again delayed. So we didn’t set sail for Agadir until about 2:00 AM, but we still made it to Agadir Morocco on time early Monday morning. However, that is another story. I will close this installment with a couple of more towel animals.